Discover our different workflows for oligodendrocytes and find the one that fits your experimental needs. Combined optimized enzymatic treatment using the Adult Brain Dissociation Kit with gentle mechanical dissociation using the gentleMACS™ Octo Dissociator with Heaters results in pure and viable single-cell suspensions. The cell suspension from adult brain contains a significant amount of cell debris and erythrocytes (A), which hampers subsequent cell isolation, cultivation, and analysis. The Adult Brain Dissociation Kit, mouse and rat optimizes the tissue dissociation process, and after sample clearing yields living cells with much less cell debris and erythrocytes (B). 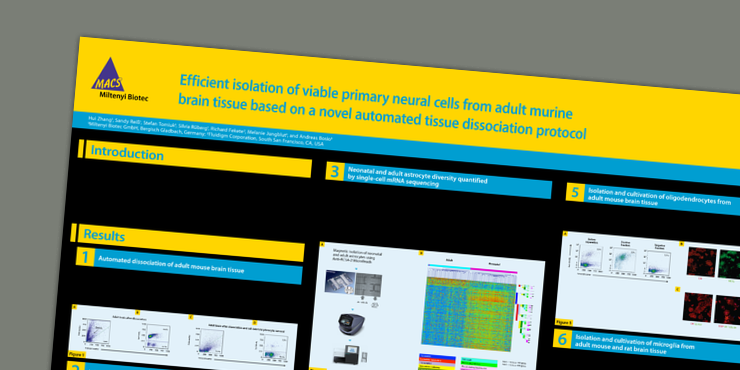 Neural Tissue Dissociation Kits allow reliable tissue dissociation and result in a high yield of viable single cells. 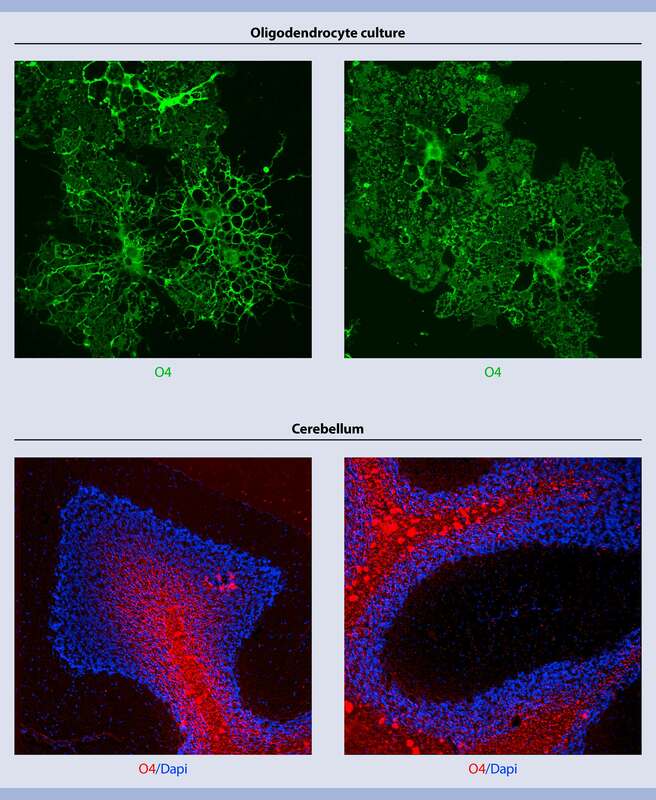 Obtain pure, viable, and functional oligodendrocyte precursor cells by positive selection with the CD140a (PDGFRα) MicroBead Kit, mouse. A single-cell suspension from P2 mouse brain was prepared using the Neural Tissue Dissociation Kit (P) and OPCs were isolated from the single-cell suspension using the CD140a (PDGFRα) MicroBead Kit, mouse. Cells were fluorescently stained with the CD140a antibody, and analyzed with the MACSQuant Analyzer. 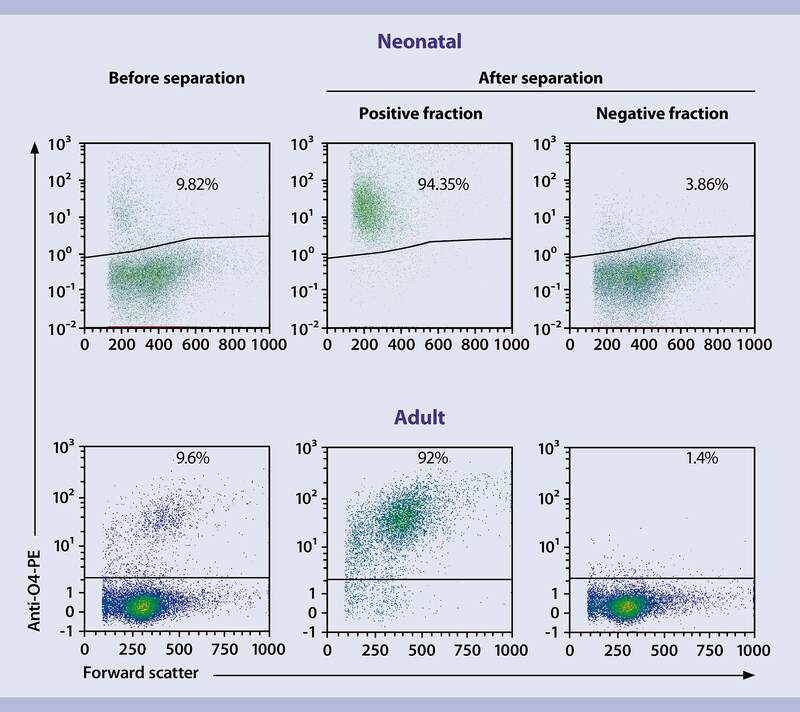 High recovery of pre-mature oligodendrocytes from neonatal and adult brain with Anti-O4 MicroBeads, human, mouse, rat. Pre-mature oligodendrocytes were isolated from single-cell suspensions of neonatal or adult mouse brain using Anti-O4 MicroBeads, human, mouse, rat. MACS® Neuro Medium supplemented with the serum-free MACS NeuroBrew®-21, PDGF-AA and FGF-2, are optimized to support growth and long-term survival of mouse oligodendrocytes. 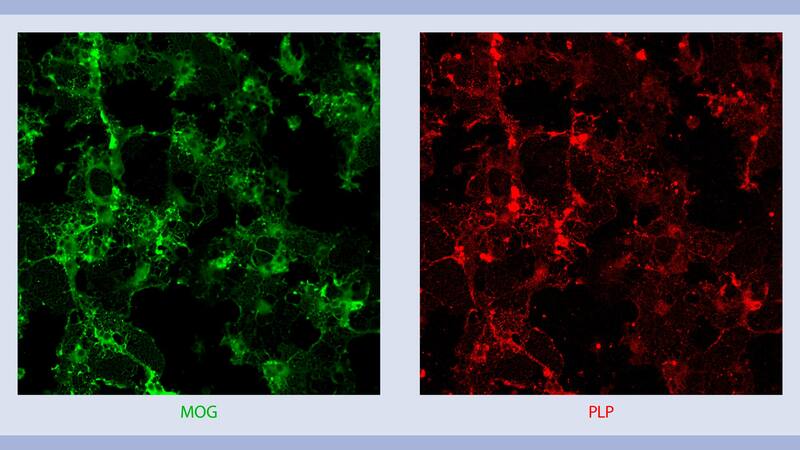 Cultured O4-positive oligodendrocytes were were fixed and stained with the oligodendrocyte-specific antibodies Anti-MOG (green) and Anti-PLP (red). A detailed staining protocol is available for download on the right. Specific immunocytochemistry and immunohistochemistry staining of oligodenrocytes from adult mouse brain. Anti-O4 pure antibody staining of PFA-fixed oligodendrocytes in culture or PFA-fixed cerebellum cryosections. 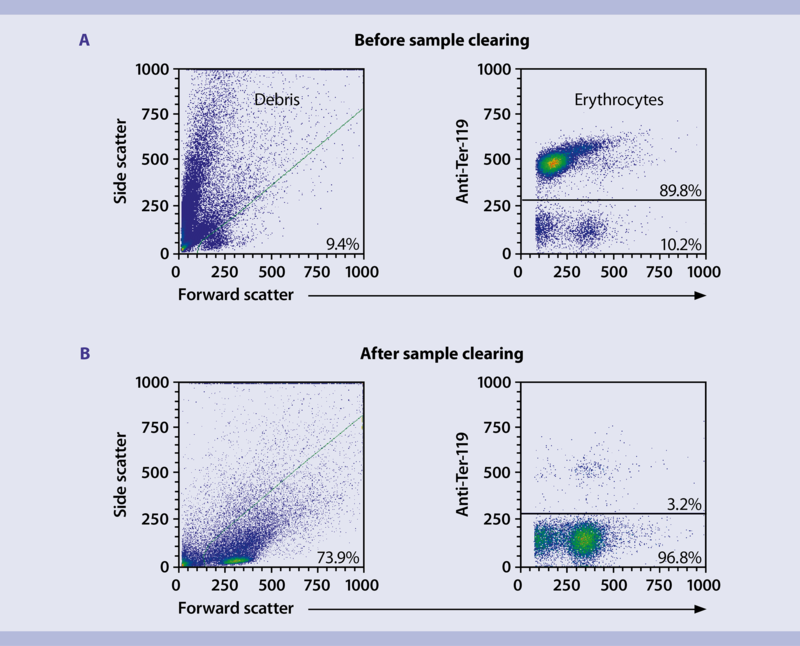 A detailed staining protocol is available for download on the right.